Personable, pleasant, hard working, with a desire to create items that will last and last – that’s my impression of Josh and Jen Koch. Oh, and those items they’re making? Why, they’re beautiful, functional leather goods. The genesis of Koch Leather (Koch is pronounced like “Coke”, not “cah-ch” for clarification) was their personal search for a good wallet. After an unsuccessful search for what they were looking for, they embarked on the process of making their own. That little foray turned into a small, part time business, which has steadily grown due to the popularity of their items, their stunning customer service, and of course, their high quality products. In fact, Koch Leather is gearing up to become a full time operation. They just launched a Kickstarter campaign to help them launch this new effort for their business. We wish them much success in this endeavor! 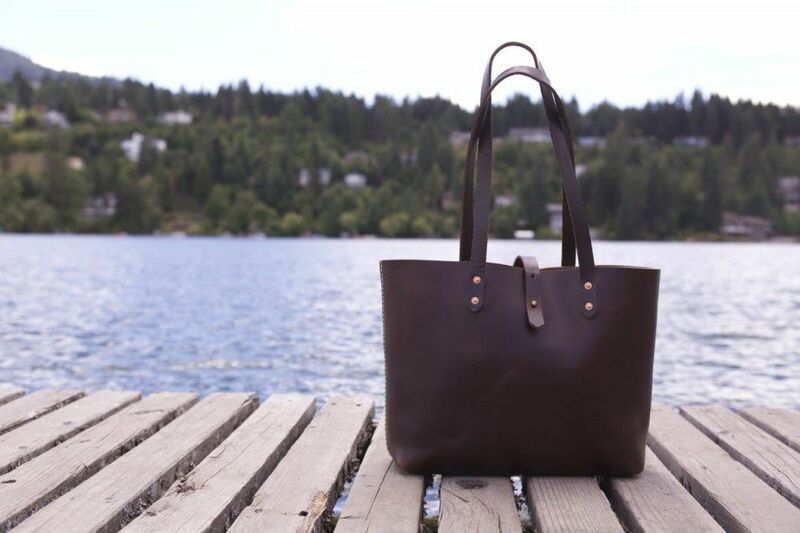 After speaking with Josh about Koch Leather, we determined it would be a good idea to review one of their popular tote bags. They offer two sizes, small and large, in their totes. The small tote measures 12″H x 10″W x 4″D while the large tote measures 15″H x 13″W x 5″D. The straps on the small tote feature a 10” drop while the larger model has a drop of 12″ to the top of the bag. These totes feature an interior pocket that’s perfect for keys, your smartphone, and a couple of other small items. Copper rivets and a silver stud flap closure keep it held together tight. 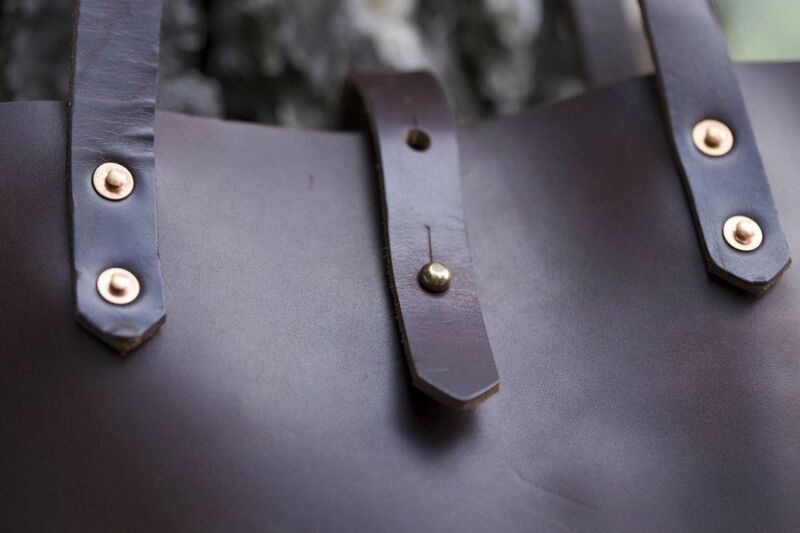 The Koch Leather Small Horween Tote sent to me was hand crafted using Horween Chromexcel in a rich brown color. The copper rivets are set off nicely with this color combination. The straps are constructed of Horween Chromexcel Double Shoulder in the same color, providing a little more substance and thickness to them that’s just right. All of the stitching, expertly done, just further enhances the bag’s appearance. This combination creates a very luxurious, high-end look and feel. Needless to say, upon seeing this bag, my wife immediately took possession of it and “claimed” it. Now she’s very happy with being able to use the Koch Small Leather Tote for whatever she wishes. The small interior pocket is really a nice feature on the tote. Out of everything on the bag, this little feature excited my wife the most. “I don’t have to fish around in it for my phone or keys…this is great!” she said right after commandeering the bag from me. The second feature she made positive note of was the strap length. For her, it’s the ideal length for shoulder carry as well as having it easily be carried down at her side. As far as storage capacity, it has plenty of room. For test purposes, she stuck her keys, phone, and a couple of pens in the side pocket with room to spare. Then she loaded up her camera and her iPad Mini. It will contain several more items with ease and still close with the attractive strap and post closure setup. It even holds two Canon dSLR bodies side by side. It seems to me that this is an ideally sized tote for one person – whether it’s used to transport personal electronics, for a quick trip to the farmer’s market, or even used as a stylish diaper bag for an evening out with your infant or toddler. It’s not big, cumbersome, or over the top in its style. In fact, it’s quite the opposite; it just does its prescribed job and looks really, really nice while doing it. Personally, I think Koch Small Leather Tote is very attractive. Josh and Jen offer their totes in several different color combinations and all of them look great. I think the dark brown Horween Chromexcel is extremely eye pleasing. As I mentioned earlier, this color really sets off the copper rivets and creates a very classy look. I also don’t see how it’s possible to break this thing while using it in a reasonable fashion. Sure, you could probably rig it in-between a couple of Clydesdales and let them do a marvelous job of tearing it apart. But, is that really an accurate way to measure the durability of something like this tote? Of course not. I’m positive that you will be able to load this thing up day in and day out for years to come and it’s just going to continue looking better and better. Horween leather, copper rivets, and heavy gauge stitching…it’ll just improve over time. I have a feeling that you’ll wear out before the Koch Small Leather Tote. 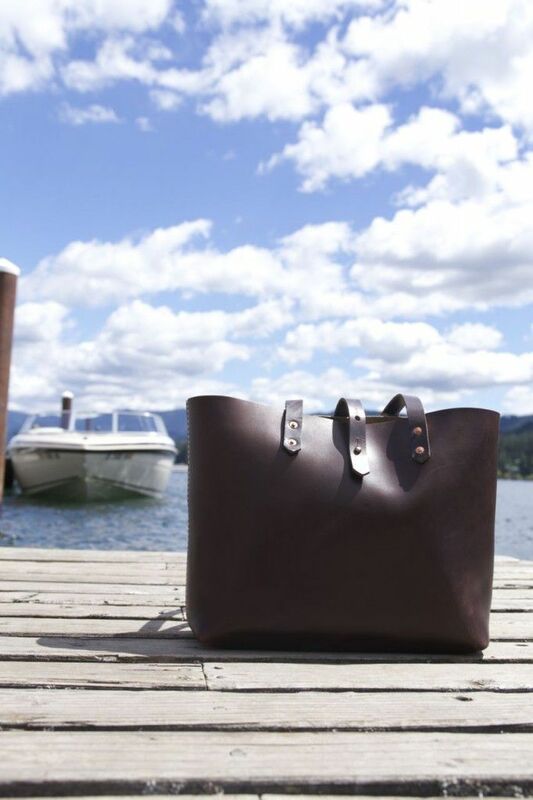 The Koch Leather Small Horween Tote definitely falls into BestLeather.org’s Buy It For Life category. The price of $165, which includes standard domestic shipping, is not prohibitive at all given the materials used and the expertly hand crafted construction. The high aesthetic value and functionality of the tote just adds to that decision. Couple all of that with the bulletproof construction and materials and you’ve got yourself a tote that will easily be handed down to your kids and probably their kids too. Be sure to check out their Kickstarter, which runs until August 17th. After that, you can always order the tote or other marvelous items created by them on their website. 5 Comments on "Koch Leather Small Horween Tote Review – $165"